Penny loafers have been sprucing up wardrobes for decades and with good reason. This preppy silhouette, constructed on our legendary Pinch last, features floral leather uppers with a traditional slot over the foot. A sturdy heel and leather sole add the finishing touches. It's the best loafers I've had, & so chic!!! Who would have come up with the idea of a floral loafers, right??!!! I mean, you didn't go with the basics, nor the 2-toned .... You jazzed it up!!! Very comfortable - i would recommend this purchase! Very cute!! Love these , fun shoes and comfortable . Can ware them with many colors. Love those! My best flats! The prettiest flats ever! Flowers are beautifully crafted, shoes fit well, true to size . This is probably the 5 or 6th pair of Cole Haan loafers I've purchased and I was blow away. There was NO break-in needed. I wore them straight out of the box without socks and had no issues, pains, blisters whatsoever! And, they're ridiculously good looking shoes. Beautiful, comfortable shoe. Love the graphics, very imaginative! Love the style, very comfortable . the flowers,flowers and the flowers!!!!!!!!! I love menswear-inspired shoes with a twist. 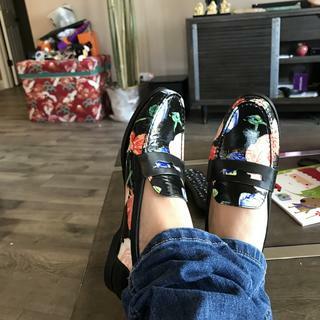 These are such beautiful shoes and now that my Skylar Oxford's have turned into my favorite and most comfortable shoe, I couldn't resist purchasing the Penny Loafer. Such a beautiful staple work shoe! My daughter wanted them for her birthday. She loves Cole Haan shoes. Love the style and print. Very stylish! I love the floral print on the loafer ! Can't wait to wear ! just loved the way it looked. will go with a lot of things. Flower power and the fact that it came in a Wide width! I'm a Docent in a Museum and this shoe has STYLE! I have several pairs of Pinch loafers...I absolutely love them! Been looking for this shoe in my size for over a year. Such a cute twist on the classic loafer style. Will definitely be able to dress these up or down as they have such a fun pattern. it's in style & it's cute! Because of the flower pattern..unusual on a loafer. 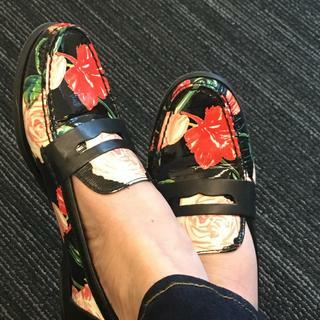 Is there any where else I can buy the floral loafer in a size 11? I need this shoe!! BEST ANSWER: so sorry, we only have up to size 10.5 available online and in stores. Will you have this loafer back in stock soon? Will you get more sizes in this style soon , also the green color loafer? BEST ANSWER: Try our Find In Store feature on the product page. Select your size (even if sold out), enter your zip code to see if the Fearless Floral Loafer is available in a store near you. Please call our online Customer Service Team for expected product availability. BEST ANSWER: Although this style is almost sold out online, you may find it to be available from one of our retail partners by conducting an online search. "Cole Haan Pinch Spring Floral". May I Prder these shoes if they currently are not available in my size. 11 B? BEST ANSWER: Our system does not offer backorder capability. Please call our online Customer Service team for more information on expected availability. What is a pinch last? BEST ANSWER: A "last" is the shape and size of the shoe; a mold of sorts that the shoe is created on that produces a certain fit. The Pinch Last is a shape for both men and women that produces a classic, full fit and is always hand-stitched. There are many different lasts that are designed to fit different feet, so if you know the Pinch style fits you well, you can be sure every pair will fit every time.